Etam Crue’s surreal girl in a jar of strawberries resonates not only with Richmond admirers, but with art lovers around the world. That popularity led to Polish artists Sainer and Bezt, collectively known as Etam Crue, to sell a limited, numbered edition of prints of the striking image. 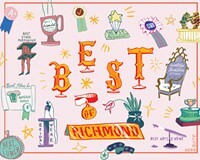 In Richmond, it’s yours for the viewing any day you choose to stroll down the concrete canyon of that stretch of Grace Street. Come to think of it, Strawberry Girl’s blue hair isn’t so far off from some more expressive Virginia Commonwealth University freshmen. The Virginia Museum of Fine Arts hired ad agency Neathawk, Dubuque & Packett to spread the word about the museum’s “Japanese Tattoo” exhibit. And the agency, in turn, commissioned Kyoto, Japan, artist Moya to paint a tattoo on the side of its building. The Canal Walk murals still draw fans of the work, which was the result of the inaugural RVA Street Art Festival.